You begin to panic the moment you get the confirmation that you need to relocate yourself. Be it an interstate or an intrastate movement, the fear of packing, unpacking and then adjusting in a new place begins to haunt you. Though adjusting is a parameter that you get comfortable with as the time passes but the most urgent issue that demands attention is the packing of your belongings. In this state of mind, your conscious stops responding accurately. You fail to evaluate the beginning and the ending point. To make this thing a little easy for you, we have come to the forefront. Here we are with the compilation of the end of lease check list. There is almost nothing that we are leaving outside the scope of this concern. Make the binder available: When it comes to shifting, a huge paper works ties up. You need to look after each and every legal document and otherwise that is concerned with the entire process of shifting. You need to keep all these documents safely, availing a binder thus makes this an easy process. Get a binder and keep all your documents here, so that whenever you need them these are handy. Inform everyone about the postal address change: Make it a point that you change your postal address prior to shifting. In case you fail to do so you might have to suffer loss in terms of confidentiality and the papers that are important to you. Also, you can give collecting all your post cards as a responsibility to any of your neighbour whom you can blindly trust. You can also give them an access to little funds so that they can forward you all the cards at you get there at the old address. You need to inform all your friends, co -workers about the move, if you wish to remain in touch with them. One thing more that you can do is cancelling all the subscriptions that you can afford to like the services that provide home-delivery and the memberships that you have an access to. These include the gyms, the clubs, the hobby groups, the organizations and much more. Arrange for the transfer of utilities: Ensure that prior to shifting you make all the utilities that include electricity, the water supply, gas, the phone connection and Internet available. If you can then do ensure proper functioning of central heating at the new apartment after you disconnect it from the existing one. Get the records organized: Next you need to keep the records of your medicine handy by collecting the same from the medical officer that you were visiting at your old place. You also need to ensure that you have gathered all the relevant documents from the school of your child, in case you have one of that age. In all this act of shifting do not forget to make your child comfortable about the same by having a word with him. Clear all you debts: Make it a point that you start clearing your bills and the piled up debt the day you get informed about the shift. This way you can ensure that you do not leave any of the obligations pending. Also, in case you have any time that you had borrowed from your neighbours then do return the same. Also, to make sure that you get the entire amount of the security back, you get all the repair work done prior to moving out. Use the floor plan wisely: Pack all your stuff in the cartons and label the same. Make it a point that you organize the cartons accordingly and label them in a way that the ones who unload the trucks can place the cartons at their relevant places by having a look at the label on the carton. One or two days prior to finally moving out there is one thing more that you need to do. Visit all the local people and your friends who reside there. Pay them a physical visit and tell them how you cherished their company. All in all, this is the End of lease moving check list. 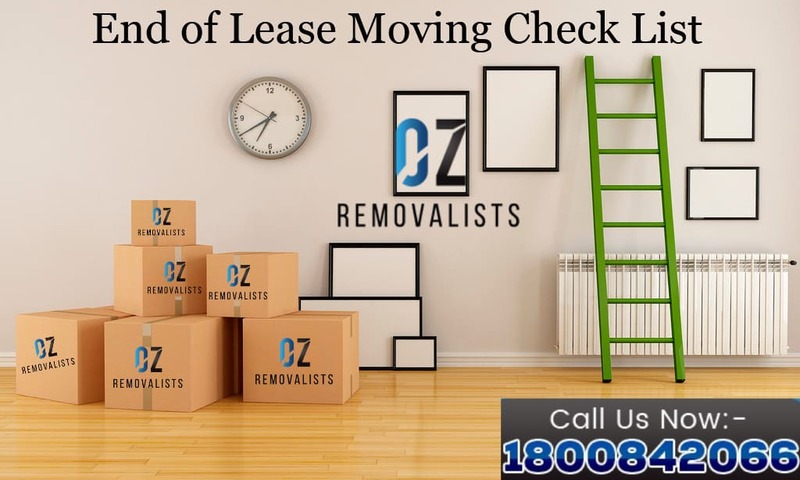 If you can afford to comply by all the things that we have listed here for you, then this is a surety that you will never face a problem moving your house. Ranging from the obvious things like packing you clothes to the other important utilities, we have mentioned it all here. This we have done with the sole purpose of making this entire shifting process easy for you so that you enter the new house with zeal and enthusiasm and not with any sort of worries. At last, we would recommend you to avail the facilities of hiring the professionals to do this for you.